A massive magma chamber, 30 by 45 miles in size, lies 3-10 miles beneath the surface of Yellowstone National Park. This colossal cavity of molten rock forms Yellowstone’s volcano, and it is in fact, one of the world’s largest super volcanoes. Despite this, the volcano is not an immediate threat to those visiting the park, and understanding how the volcano breathes life into Yellowstone may help ease any potential concerns you may have. Here are nine frequently asked questions and answers regarding Yellowstone’s supervolcano. 1. What is a supervolcano? Yellowstone is considered to be a “supervolcano,” which refers to volcano capable of an eruption of more than 240 cubic miles of magma. Two of Yellowstone’s three major eruptions met the criteria to be considered a supervolcano. 2. What is the difference between a volcano and a caldera? A caldera is a massive crater-like bowl that forms after a volcanic eruption and/or the collapse of a volcano. A volcano is a vent or fissure which contains a magma chamber and can erupt with lava or volcanic gasses through the surface of the earth. 3. Has the volcano erupted before? Yes. Yellowstone’s caldera was created by a previous volcanic eruption, which took place approximately 640,000 years ago. The last eruption of this volcano took place about 174,000 years ago, and created the West Thumb area of Yellowstone Lake. 4. Will the Yellowstone Volcano erupt soon? Although the volcano is active, there are currently no signs that any disastrous eruptions are going to occur. Experts within the National Park Service and other agencies have been monitoring the volcano’s activity for over 30 years, and have seen little changes in the geological activity. Though possible, the next massive eruption is not expected to occur within the next 1,000-10,000 years. The volcano may act in other ways, though, and park personnel have been trained to assess any potential hazards and react to protect park guests accordingly. 5. How do scientists know the Yellowstone volcano won’t erupt? Scientists from the Yellowstone Volcano Observatory (YVO) watch an array of monitors in place throughout the region. These monitors would detect sudden or strong movements or shifts in heat that would indicate increasing activity. No such evidence exists at this time. In addition, YVO scientists collaborate with scientists from all over the world to study the hazards of the Yellowstone volcano. To view current data about earthquakes, ground movements, and stream flow, please visit the YVO website. 6. Is Yellowstone truly safe to visit despite the volcano? The volcano is what powers Yellowstone’s incredible thermal features and fuels the park in a multitude of other ways, and there currently is no evidence that an eruption is soon to occur. 7. How does the park staff monitor the potential for eruptions? Monitoring the volcano 24/7 is a joint effort, and experts maintain specialized equipment to constantly track the volcanic activity within the park. Data collected is shared with scientists from all over the world to effectively and accurately keep track of the information collected from the caldera. 8. How far in advance would there be warnings of an eruption? Scientists believe there will be plenty of forewarning regarding eruptions, thanks to great progression in research and understanding of the volcano within the last 25 years. Forecasting possible eruptions in particular has been a huge part of those advancements. Scientists with the YVO believe warnings of any significant activity could appear as early as weeks to months and even years before the eruption would actually take place. Signs pointing to an eruption would comprise events such as intense earthquakes and extreme deformation of surrounding grounds, all of which YVO watches for. However, it is important to remember earthquakes and changes to the environment (like thermal basins) are quite common in Yellowstone and do not indicate an eruption is imminent. YVO works with the U.S. Geological Survey, the University of Utah and the specialists in the park. 9. How will the park spread the news in case of an eruption? Park staff has plans to effectively and efficiently spread emergency information through a 24-hour communications center. This communications system works to alert park guests, employees, surrounding communities and other parties, including government agencies. Simply put, Yellowstone National Park would not exist without the volcano. 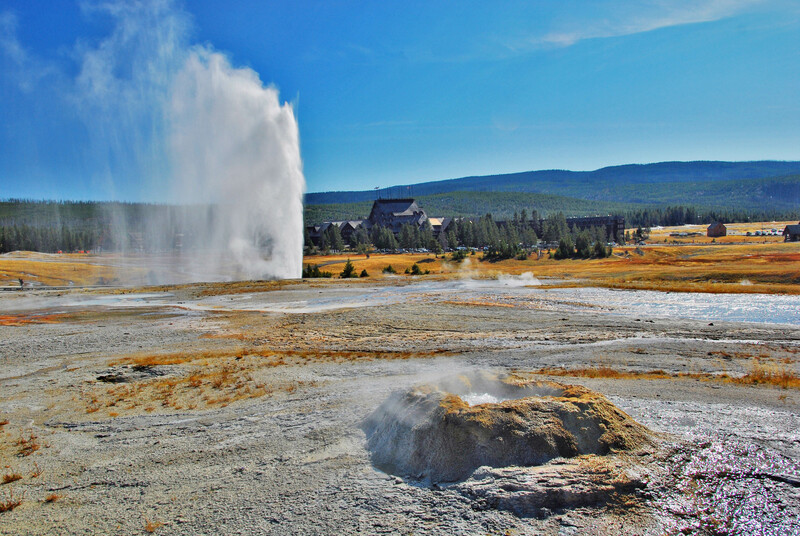 It is the beating heart of the park, which powers the geothermal features, helped form the magnificent mountains, contributes to certain vegetation, and much more. There is much evidence showing that earth is alive in Yellowstone, thanks to the volcano below. It is not something we should fear, but something we should respect. For more information regarding Yellowstone’s volcano and caldera, please visit the National Park Service’s FAQ page regarding the volcano, or check out the Visitor Center located at Canyon Village.